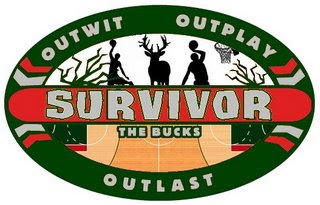 Bucks Survivor: Round Seven ~ The Bucky Channel - The World of Sports from Wisconsin's Perspective. Stack, out. Kudos to Jerry Stackhouse to making it into the final eight, but holy cannoli was he voted off with an overwhelming percent of the vote. Stackhouse finished with 65 percent of the vote, much higher than the second leading vote-getter in Luke Ridnour, who had 11 percent of the vote. Brandon Jennings is still receiving votes this early in the game as well, which doesn't really make sense to me, but oh well. This week we're already down to just seven Bucks, and we'll find out soon who this year's Starting Five and Sixth Man will be. The way the votes went last week for second place, I'm expecting a three way race between Luke Ridnour, Luc Richard Mbah a Moute, and and Ersan Ilyasova. But I don't know, go head and surprise me. Voting will last until 6pm on Tuesday night, and even though there is a holiday this weekend we're still going to keep the voting schedule the same. We know that Memorial Day weekend is a historically low internet weekend, so we won't be surprised if the voting totals are a little lower this time around (aka we know that people are leaving this site in droves, and are hiding behind our tears). Remember, you vote at the top right of this blog, and again vote for who you'd like to see be eliminated.